There's another great sketch on the Clean and Simple site this weekend! I haven't strayed from the original sketch at all except by making the central panel much smaller. ...In fact it doesn't really show on this photo but in Actual Real Life (as my lovely daughter would amusingly say) it is glaringly obvious. I am pleased with the flowers though. When they were just punched from card stock they seemed too stiff for this card, so I crumpled them up and split them carefully so that I ended up with two papery flowers from a single card stock one. Then I layered two sizes of papery blooms together and separated the petals with sharp scissors. 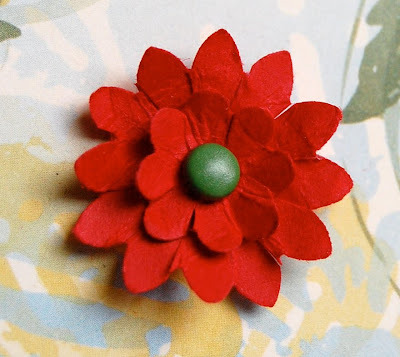 I got the idea for splitting the flowers from Heather Pulvirenti who made this gorgeous flower with the scallop circle punch. Thanks Heather! This would have been an incredibly quick card if it hadn't been for my hunt for a matching brad. I am so looking forward to my delivery of Stampin' Up brads - I'll never have a problem matching colours again! Hope you're all having a lovely weekend! Love the idea with the flowers :) they look great. Isn't it funny how the camera makes the brads look the perfect colour! I love your card. 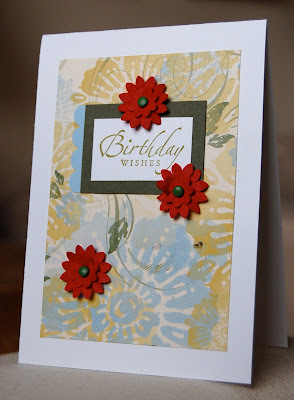 The red flowers really makes the card stand out and the blue scallop border softens the birthday wishes. It's very well balanced and really is a beautiful card. Great card.. you can make any color of brad with pigment ink and clear embossing powder... or you can use versamark and colored embossing powders.. They look really cool!